Labor Day Fun Day Sale!! This is the one you have been waiting for! 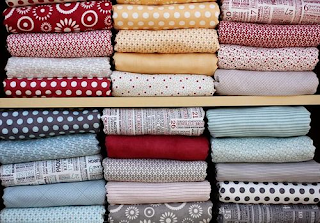 Been eye balling your favorite book, pattern or fabric? Well, now is the time to buy it cause girls its on SALE!! Starting tomorrow Thursday Sept. 1 until Monday September 5 we are having a Big, I mean ginormous Sale!! *Select models on sale!! *Halloween fabric and kits and patterns 10% off the entire weekend. 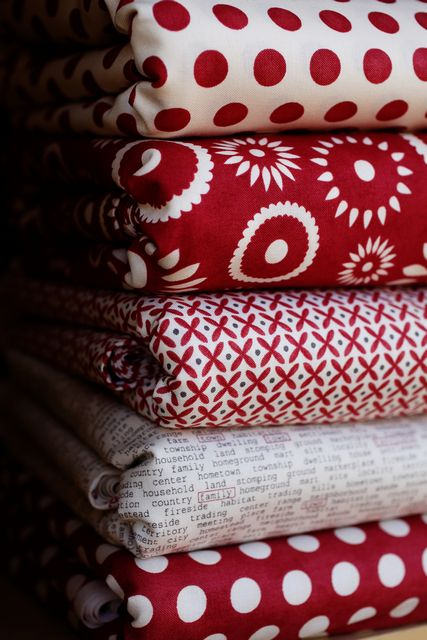 *All Lecien fabrics 10% off. *Thursday- all books patterns 30% off. 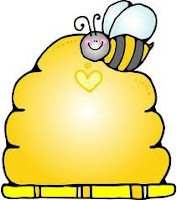 *Friday-All pre-cuts (charm packs, layer cakes & jelly rolls 20% off . *Saturday-entire shop an extra 10% off your entire purchase!! Really girls, you don't want to miss this! See ya later gator:) Nadine & the girls! We have a new product in the shop. It is called Glubers. Think of glue dot but for fabric. The package shows and instructs how to use them for rolled rosette flowers, but I have used them with other types of flower and yo-yos. Using them is fabulous. No burnt fingers from hot glue, perfect circles each time, and the double sided sticky helps hold the flower in place while you stitch it onto your project. There are multiple sizes of dots. The minute I saw this line I knew we had to have it at the shop. 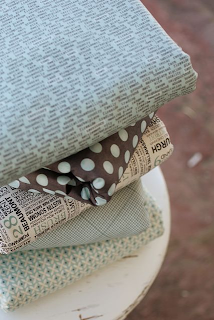 Nine Dots designed by Carrie Nelson is cool pastels with a hint of grey mixed with pinks, aquas, yellow. It's yummy! My mind has be going crazy trying to pick out my next schnibble to make with this line. This will make you drool, it is so cute! What would you make? Purse? Skirt? Quilt? The possibilities are endless. And, we do have the entire line!! So stop by the shop or give us a call 801-495-4290, and order yours. I have posted pictures to go with the tutorial. This was meant to be posted on August 21, but I couldn't get it to post in California. so better late than never!! Sheesh! I have been a bad blogger lately. I just returned from a vacation in San Diego with my family and we really did not do a lot other than eat and lay around. However, I did make it to 2 quilt shops in the area and both were fantastic. The Country Loft was our first stop. We took a cab and arrived at this quaint little white house that was full of the cutest doll, quilts, and all with a country twist. The displays were so enticing and cute. I think my mouth was hanging open through the entire shop. CUTE!!! We got to talking with the employees and a customer and, before we knew it the customer (whose name I have forgotten sorry! dang, memory) had offered to drive us to the other quilt shop. She was so kind and we talked each others ear off all the way to the other shop. Then it was off to Rosies Calico Cupboard where our tour guide took us in to meet Rosie but she wasn't in but took me into the classroom and introduced me and a darling lady who jumped up and gave me a hug and said she loved our blog! I was flattered and somewhat in awe that she had heard of us. Rosies was ginormous!! I think they have like 15,000 bolts of fabric. So, Thank you to our friend that gave us the ride and also to those of you who read our blog. 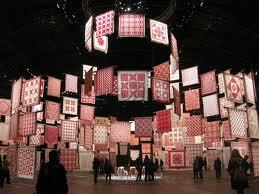 Quilters are the nicest, kindest bunch of people you will ever meet. I am very thankful that I get to work in a job that is so much fun and filled with the most amazing people. Sorry about the absence of tutorials. I was having too much summer fun, but I am now back and ready to go with fun and fabulous ideas. Have you ever wanted a small space to iron on next to your machine while you piece a quilt (such as the farmers's wife quilt along) Or needed a space to iron at a class or late sew. Here is your answer, a press board. I love mine and carry it with me all the time. I am even tempted to buy a small iron and put it in a bag with a press board so I can pick and go whenever I want. ---Layer your fabric in this order RIGHT SIDES DOWN - Fabric, batting, batting. ---Lay your board on your batting. ---Repeat this last step for the left and rights sides.--just make sure the fabric is pulled tight on the work surface. --Your board can be any size you want. Just cut your fabric and batting to 4 inches bigger than the board. 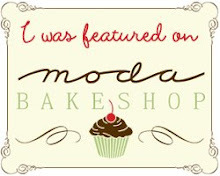 I admit it, there is something about Moda's Sweetwaters lines that I just gravitate to. I love the colors of the new Hometown line so much. My friend Christina is using this line for the Farmers Wife Quilt Along, and it is so cute!! 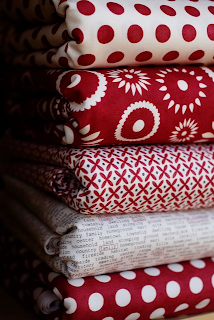 Reds, blues, yellows make up this fun line and they have released some darling patterns along with it. We have the entire line and all the pre-cuts, just in time for a new project!! Come in and check this out!! Very cute!! 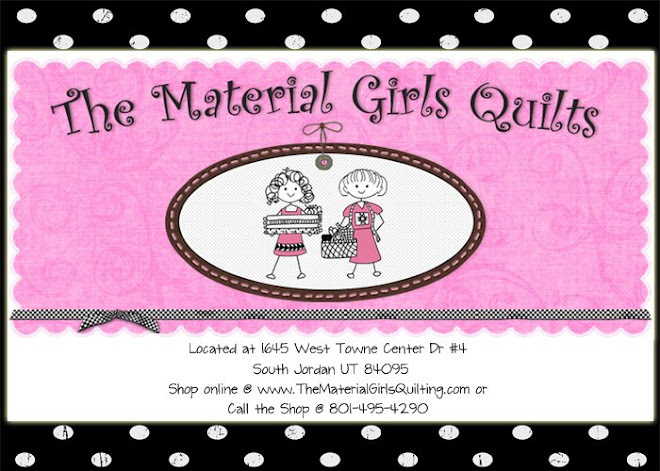 I am so excited to announce that we (Material Girls and South Jordan City) are organizing a quilt show to be displayed in downtown South Jordan. We will have different categories for entries, including a kids entry, with prizes, and all kinds of good things. The show will be Saturday October 8th. We are still working out some of the details but I thought I should let you all know so that you can start your project to enter. I will keep you posted on here or our Facebook page. If you have questions please give us a call at the shop. (801-495-4290. Okay, I seriously was a little worried about Shelby's newest project. She is helping her boyfriends brother and new sister in law with there wedding decorations. Did I mention I love this family! She is making 12 tablesquares, 2 pennant banners, and 2 tablerunners. Wow, but what a trooper she has been. She designed the tablesquares and hopes to finish those (13 of them) today. I must say her creativity overflows!! They are darling!! She is using Burlap, a brown checkered houndstooth and a yellow design from Heather Bailey. I am so proud of her!! Here is a little sneak peek, and I will post finish pictures of it all later. They don't need to be done till August 13, so wish her luck!! Shelby you are a gem!